This Natural Beef Steak Sticks is labeled as "Original", as well as "soy free" and "gluten free", using grass-fed beef raised without added hormones or antibiotics. It has no MSG and no preservatives and is said to meet Paleo requirements. We first reviewed Divine Bovine 5 1/2 years ago, back when the company was relatively new. Since then, the company has eliminated its original Honey Teriyaki-based recipes and replaced them with all new recipes, as well as introduced new packaging. Divine Bovine's beef jerky is based on beef brisket, which it claims to be more tender and sweet. The company describes it's story as beginning in Southern Italy when a butcher discovered a great recipe and cut of meat for jerky, who eventually handed it down to his grandson, who started the Divine Bovine brand. This Spicy Jalapeno flavor is labeled, "Gluten Free", and is described as being "...drenched in a mild blend of savory spices and “Pop’s” unique recipe, an exotic blend of spicy jalapeno, with an irresistible kick of cayenne." Brave Jerky is a new brand that just barely got started, and is still technically in the fundraising mode with a campaign on Kickstarter. It was launched only weeks ago by Brad and Michelle Summey out of Washington DC. The company aims itself towards the meat snacking crowd who really love spicy hot jerky. According to its tagline, "...our spicy jerky aims to weed out the weak and reward the brave." Hence the name of the company, Brave Jerky. It has also developed a unique marinade based on a Cuban recipe. Thus far, the company plans to launch with four flavors, Mojo, Jalapeno/Serrano, Habanero, and Ghost Pepper Buffalo. We were sent samples for review, but because the company is not selling live to the public, we're withholding ratings. If you want to donate to their funding campaign, visit their Kickstarter Page. The newest flavor from Jeff's Famous Jerky is this Pacific Red Hot Chili Pepper. See previous reviews from Jeff's Famous Jerky. Jeff's Famous Jerky officially opened for business in 2010 and is owned and operated by Jeff's Famous Foods, Inc., led by founder Jeff Richards and CFO Mike Aggarwal, out of Mission Viejo, CA. The company offers ten flavors of jerky, all hormone-free, American beef, without added MSG or preservatives. This new Pacific Red Hot Chili Pepper beef jerky is said to be made from a hot chili pepper sauce they imported from friends on the island of Guam. The sauce is made from the Donne Sali Pepper, also known in Guam as Dinanche. The packaging claims this jerky to be "Medium Hot". Mark Carter has been making jerky for a decade out of his facility in Indio, CA. He markets it via word of mouth and sells it locally. After putting more effort into designing a label and brand, he's ready to go global. Carter's Deep Woods Style Beef Jerky is made from London Broil and a special marinade that was perfected over the years. After marinating the meat, Mark brushes on another layer of sauce before smoking it over two types of woods. He also does venison and elk with the same recipe, but mostly for folks who bring him the meat. He's currently looking for a jerky company that wants to license his recipe. 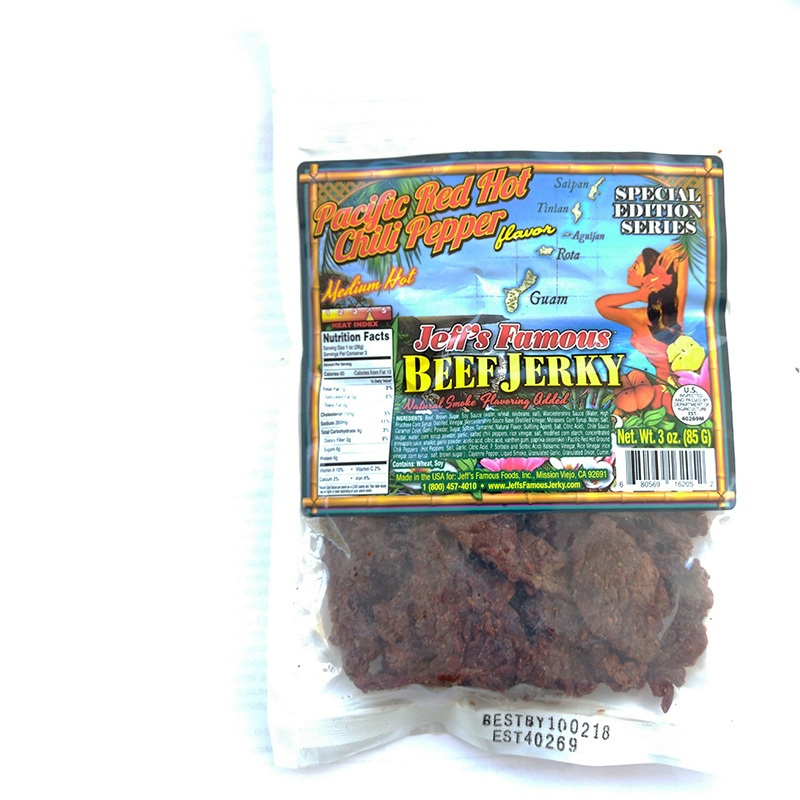 Kings County Jerky Co. is a brand of jerky based in Brooklyn, NY. Launched by two cooks Chris Woehrle and Robert Stout in November of 2009. The company has enjoyed a lot of recent press in the news as an artisanal jerky manufacturer. In 2009, both Woehrle and Stout grew tired of their day jobs and sought to launch a business venture together, and thus was born Kings County Jerky Co. The pair got a big boost when they finished 2nd place out of 150 contestants in the Rooster Design "Next Big Small Brand" competition, earning a big hit from the crowd. The company focuses on humanely-slaughtered, grass fed beef. They use all natural ingredients, no MSG nor preservatives.